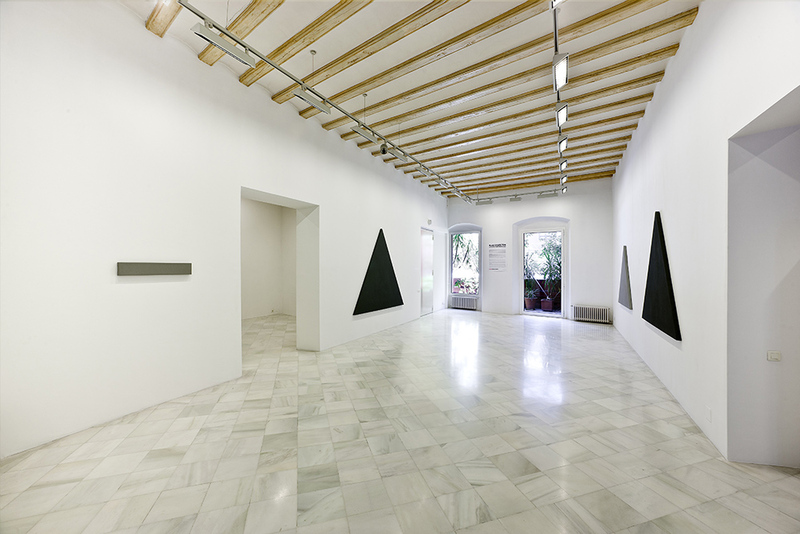 Miguel Marcos Gallery is pleased to invite you to CROSSES AND TRIANGLES, the third exhibition of British artist Alan Charlton (1948, Sheffield, United Kingdom) in Barcelona. Over the last forty years Charlton has been loyal to the fundamental principles of his work: geometric and monochrome canvases in different shades of grey. Despite the fidelity to his pictorial convictions, in recent years Charlton has explored a wide variety of formal possibilities presented for the first time in Miguel Marcos Gallery. In the creative universe of Charlton, the form and the process, in which are involved geometry, mathematics, egalitarianism of components, monochrome colours and the use of industrial materials, have resulted in a very particular vision of pictorial creation moving away from materialism to embrace the minimal movement. Painting that is “abstract, direct, urban, basic, pure, simple, quiet, honest and absolute”. The technical construction of the Charlton’s paintings is always the same. Part of modules of 4.5 cm from which determines its length and width, create structures that evolve on their own internal logic. This measure is the golden ratio of the artist. In essence, the necessity to find the perfect and most harmonious measure of an object has been a topic from Plato to Euclid, from Leonardo to Mondrian. In fact, the Golden Mean as an aesthetic canon has been consciously used as a technique not only for paintings, also in architectural and musical world, as the music of Johann Sebastian Bach or the minimal forms from John Cage. On the other hand, the reason for using grey colour began with the idea of making a painting with ordinary materials while he was studying at the Royal Academy of Arts in London around 1986. The grey is usually regarded in the art world as non-colour, is not a start point or end as in the case of white or black, it is a central point, motionless on the surface. 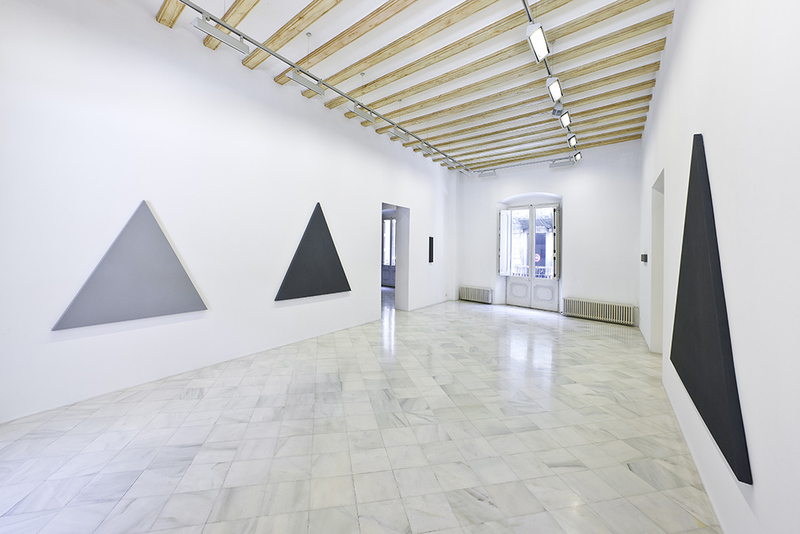 The art critic and sociologist, Arnau Puig, commented that “In front of this idea of colour purity, achieved progressively, perhaps the best tone is grey; there fit all sensations and all shades of inner calm. This is the Charlton’s work: no philosophical, no dramatic, no existential, just nothing”. These works have redefined the traditional relationship between artwork and viewer, because, in most of cases, the paintings are not specially made for a concrete space. In fact, the works adapts to changing conditions of different environments and this is due to the accuracy of Charlton’s canvases. 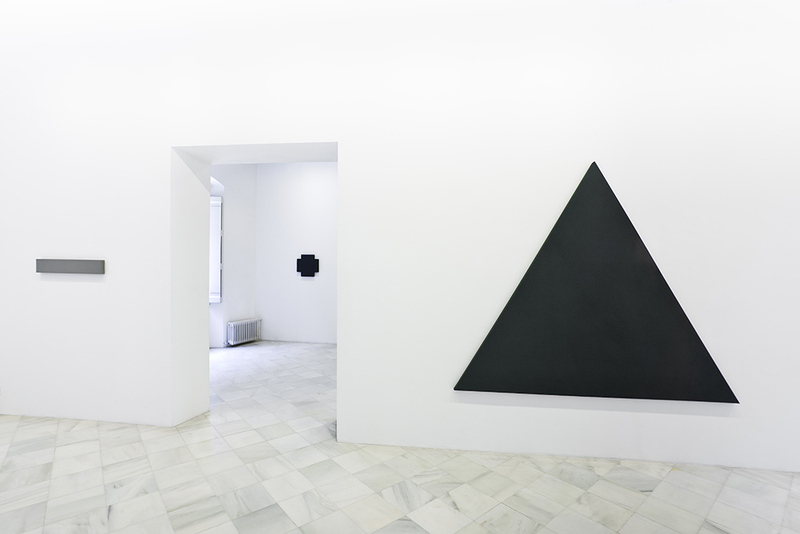 Hence, his paintings offer very different visual experience depends on the space in which they are located. New paintings have been selected on the occasion of this exhibition. 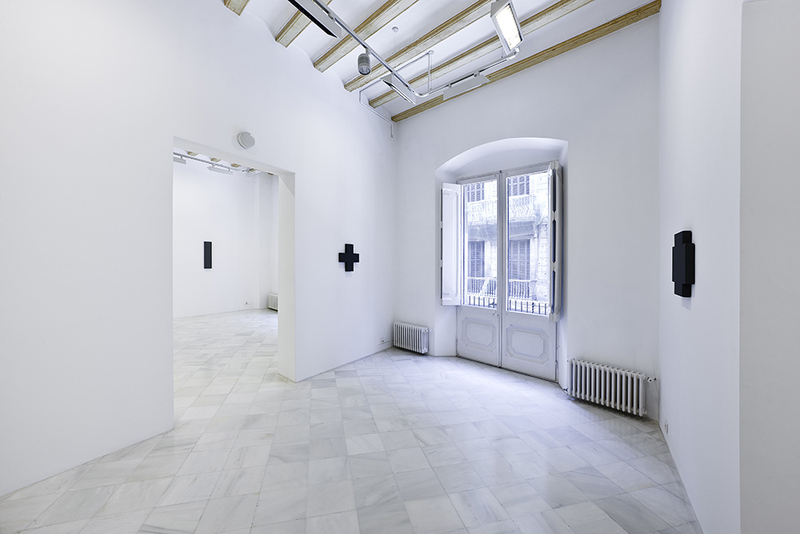 CROSSES AND TRIANGLES with vertical paintings are lain out in a white space that invites to repose and to watch. Penetrable structures do not need it explanation neither why they were created nor for why they have being. It is like a Samuel’s Beckett parody, who said: “I have nothing to say and I am saying it”. And even so, comply perfectly with the ideal of honesty artist, that has become in a totem throughout his entire career: “One of the most important, or perhaps the most important quality that the work always has to maintain is about an honesty, and an honesty to the space that it exists in, to the way that it’s made, to the intensions of how you look at it. In some ways I never actually had to question, it was just indistinctively of knowing which was the right thing to do at the time. It’s only after doing the painting that I perhaps fully understand what the painting is actually about”. Powerful and eloquent atmospheres, hanging and motionless systems those combine conceptualism and experimentation in harmonic and structural space, dark labyrinths which have enlightened by the ideas of this master of the XXI century. ALAN CHARLTON was born in Sheffield (United Kingdom) in 1948. He studied at the Royal Academy of Arts of London, which began his artistic path accompanied by strong aesthetic convictions. In the early seventies began to exhibit solo shows, activity that develops without interruption around the world. These exhibitions serve to reinforce Charlton’s theory about the relationship of the work and space. In fact, in most exhibitions the works were not designed for that place in it. Charlton’s work forms part of some of the most important Museums and public collection such as Arts Council Collection (London, United Kingdom), Contemporary Art Collection ‘La Caixa’ (Barcelona, Spain), Centre Georges Pompidou (Paris, France), Musée d’Art Moderne de la Ville de Paris (Paris, France), Museo d’Arte Contemporanea Castello di Rivoli (Turin, Italy), Museum Abteiberg, (Mönchengladbach, Germany), el MuHKA Museum voor Hedendaagse Kunst (Antwerp, Belgium) and Tate Gallery collection (London, United Kingdom).